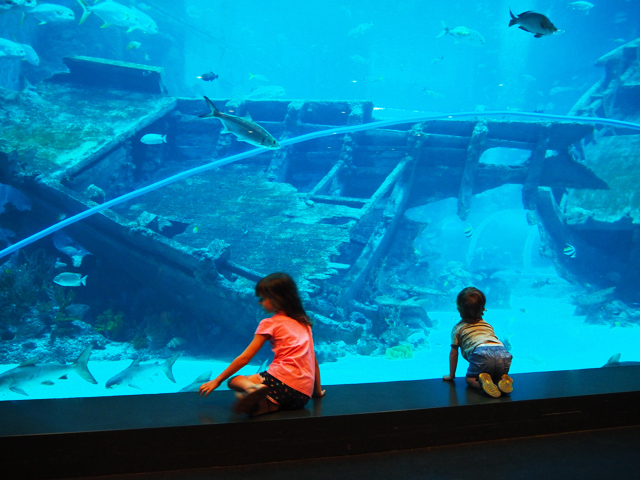 The S.E.A (South East Asia) Aquarium located within Resorts World Sentosa is the world's largest aquarium. Home to more than 100,000 marine animals of over 1,000 species, across 50 different habitats, each one as fascinating as the next. 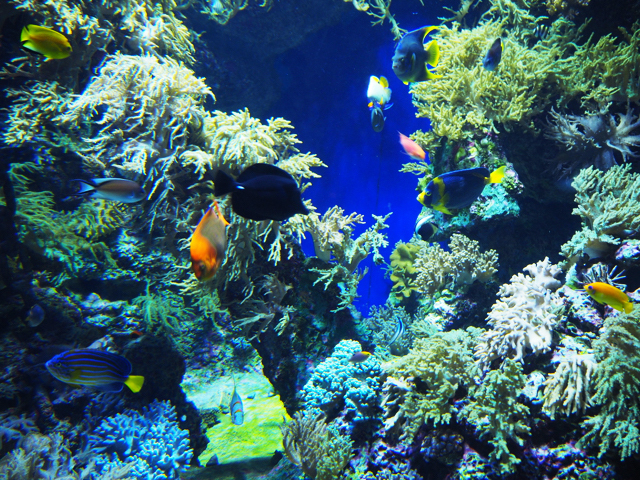 The Aquarium spans more than 45 million litres of water. The S.E.A Aquarium takes guests through 10 different aquarium zones, covering the vast oceans of the planet through some 49 habitats. From the Strait of Karimata and Java Sea zone which includes the Shipwreck at the entrance of the Aquarium to The Strait of Malacca and the Andaman Sea zone, Red Sea zone to Shark Seas zone on your way out to name a few. The Aquarium covers all seas! The gorgeous displays of tropical fish and coral around the aquarium is just fascinating and some of the displays were like nothing like we have ever seen before! The Discovery Touch Pool was a fun way to touch and learn about sea stars, sea cucumbers and other fascinating marine invertebrates. Highly recommended and included in entry fee. 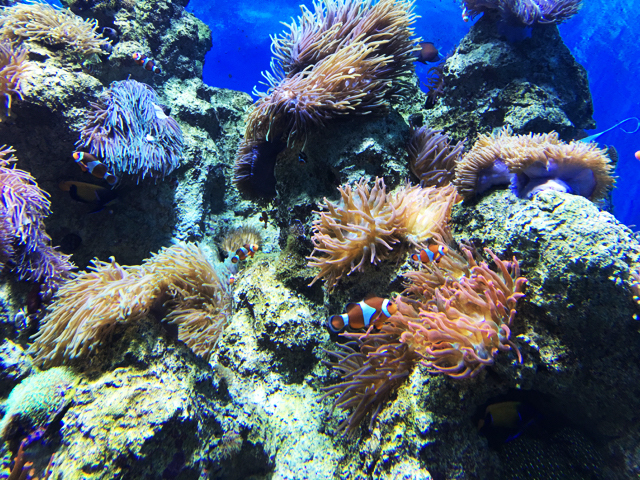 There's lots of little nooks and crannies around the aquarium for kids to observe different fish and species. 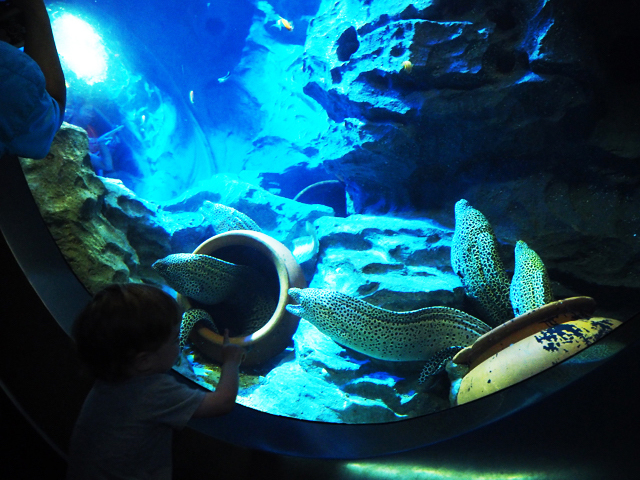 Like the giant moray eels' little tunnel kids can walk through and observe the eels from there. Or the 'close up' spots on some of the aquarium exhibits and the educational section. Our favourite zones include the East Africa zone which showcases the amazing life forms that the freshwater lake ecosystems have evolved to occupy unique niches, and are found nowhere else on earth. 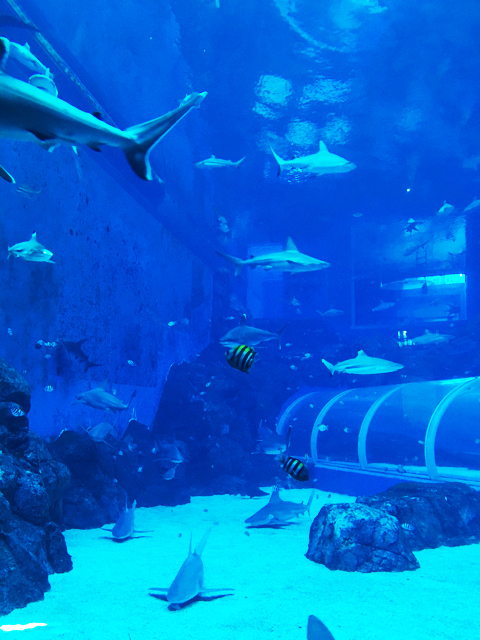 The Open Ocean Habitat zone showcases the Ocean Gallery which is the centrepiece of the Aquarium where visitors can see through the world’s largest aquarium viewing panel that measures a staggering 36m wide, 8.3m tall and 70cm thick. The gallery contains more than 18 million litres of water and home to more than 50,000 marine animals. And last but not least, my son's favourite zone of all, the Shark Seas zone - so impressive and you'll see why! We had a fabulous time at the S.E.A Aquarium, such an amazing Aquarium filled with some of the world's most fascinating fish and creatures! We highly recommend a visit if you come to Singapore and Sentosa! The S.E.A Aquarium is located within Resorts World Sentosa on Sentosa Island at 8 Sentosa Gateway, Singapore which is about 30 mins taxi ride from the city. There are many ways you can get to Resorts World Sentosa, there is a Sentosa train, you can take a taxi there or walk from the Sentosa train station located in VivoCity Shopping Mall. Allow a minimum of 2 hours to fully appreciate the Aquarium. The S.E.A Aquarium is open every day of the year from 10am to 7pm. There are toilets and food outlets located around the aquarium. The S.E.A Aquarium is pram and wheelchair friendly however it can get squishy when it's busy. Ticket prices are as follows: per Adult S$39 or per Child S$29 or per Senior S$29. Bring snacks, hats, sunscreen, water bottles, comfy shoes for both kids & adults however outside food is not permitted in the aquarium except for baby products and restricted to designated areas. Busy City Kids were invited to the S.E.A Aquarium in Singapore for the purposes of a review. All opinions & feedback are genuine & truthful. Travel, food and fee paying activities were self funded. To read our other Singapore reviews, head here. For more information on S.E.A Aquarium, head to their website.